The show, called The Business of Innovation, will be hosted by Maria Bartiromo. Guests will include Starbucks CEO Howard Shultz, Southwest Airlines CEO Herb Kelleher, Fashion Mogul Mark Ecko, Randy Komisar from Kliener Perkins, Sirius Radio CEO Mel Karmazin, Nobel Prize winner Muhammad Yunus, and many more notable thinkers and business leaders. The first of five episodes will be premiered in the USA Monday, June 2nd, at 9pm on CNBC. More details can be found at The Business of Innovation's website. On February 25, 2008 IdeaConnection published my interview with author Scott Berkun. No doubt he will provide some interesting perspectives on CNBC—like his book he will provide good, not-so-common, common sense based on careful research and clear thinking. I will be watching CNBC on Monday nights. Scott Berkun teaches at the University of Washington, provides high energy talks, workshops, courses and consulting services. 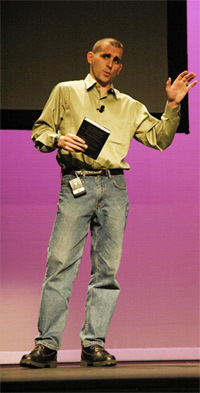 He was a member of the Internet Explorer team at Microsoft from 1994-1999. And now we can say he appears on television as an expert on innovation.